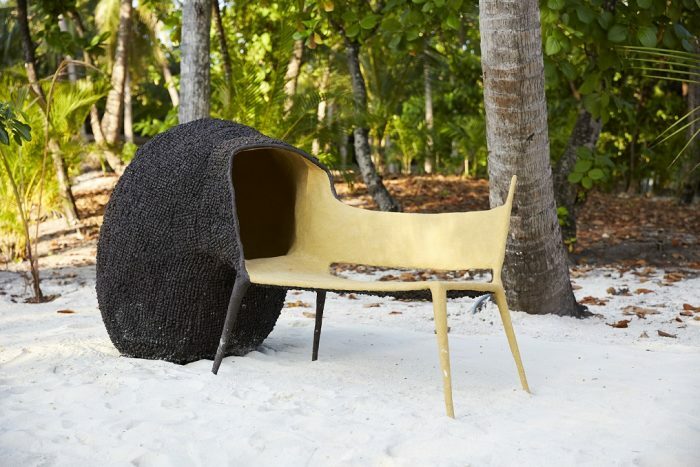 Conceived as an immersive island retreat, JOALI Maldives showcases an array of original, experiential works of art and dynamic design, reflecting the beauty of nature, and with sustainability at their core. 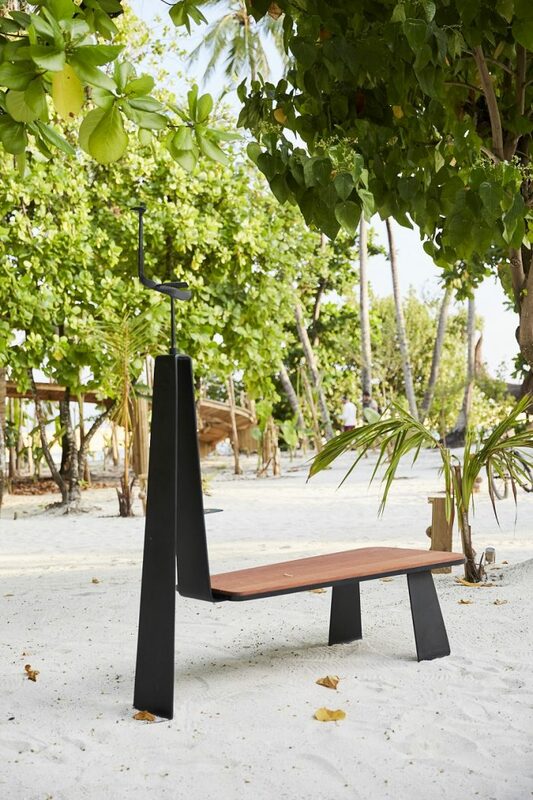 Situated on the idyllic isle of Muravandhoo in the remote Raa Atoll, just 45 minutes by seaplane from Male, this unspoilt island celebrates the creativity of world-class talent. Adding a touch of timelessness to the natural landscape with his abstract style, John has created a special version of his celebrated Bench with a mini heron sculpture, for the island’s human and bird visitors to rest and reflect among the palm trees, along with a ledge to place a cold drink. 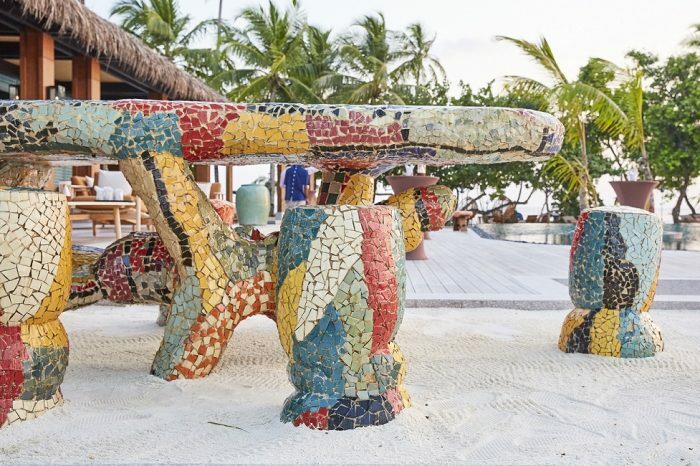 Believing in a human need to rediscover the art of hand-crafting their own furnishings with needle and thread, Soojin has woven elaborate tapestries for Joali’s Four Bedroom Beach Villa using only natural materials. The scale of the pieces accentuate the high ceilings with long strands flowing artistically down the wall from top to bottom. Ardmore’s textile pattern for Joali uses the emblematic grey heron and frangipani seen on the island, and evokes the exoticism and remoteness of this tropical location. No LaB adapted this pattern for the stylish in-villa beach kaftans designed for guests to gallivant in, as well as special hand-carved panels for Joali’s Bellini restaurant. Inspired by his past experience working in a Colombian brick factory and emphasising the importance of human influence on the production process, Wolston has created a set of clay chairs where the finger marks of the artist can still be seen. Residing outside Joali’s Boutique, these intricately-detailed chairs contrast with the beautiful fauna around them, and challenge visitors to take a seat. 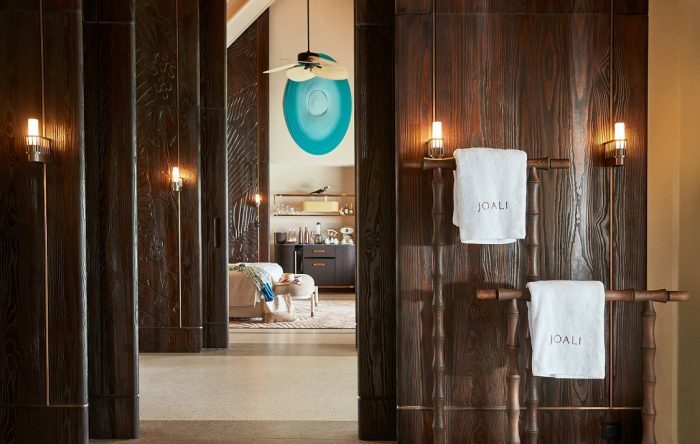 Located in Joali’s boutique, Doug Johnston’s organic-shaped light shades reflect the textures and waves of the island. Made from coiled rope, stitched using industrial sewing machines they demonstrate skills gleaned in masonry construction, 3D printing, basketry and cordage. With a gift for forming glass into intricate objects, Onar’s tropical, pink-tinged glass drinks decanter in the shape of a pineapple and coral, is an amusing, eye-catching element to each of the villas’ mini bars. 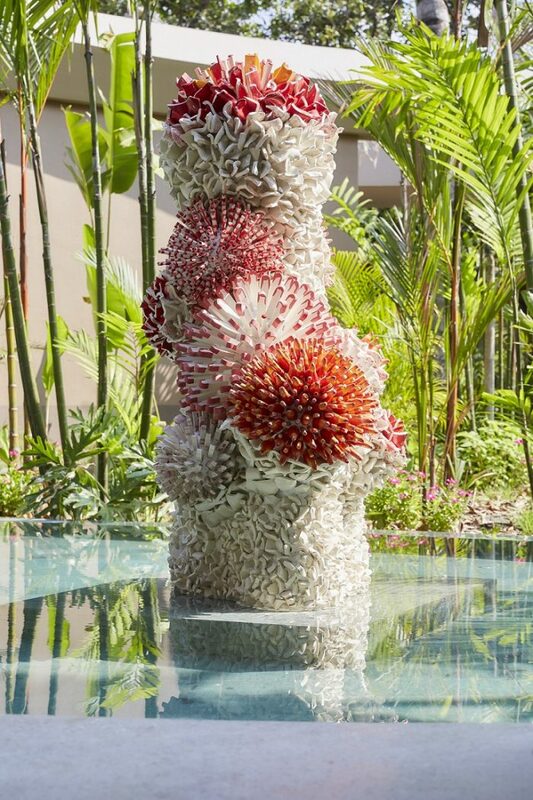 Inspired by shapes of the tabletop Tepuis mountains of his native Venezuela and the curvilinear forms of heritage hourglasses, Senguino’s clay stools using mud from the Guiana Highlands’ region’s rivers, designed to last for many years, absorbing the sun’s warmth and the tales of the guests who enjoy sitting on them as time passes by. Joali’s impressive roster of artworks are integrated with impeccable design and architectural skill by acclaimed Istanbul-based Autoban, whose other projects include House Hotels Istanbul and London’s Duck and Rice. They used custom-made furnishings, hand-carved wooden panels, local wood, bamboo and terrazzo flooring to create the ultimate sense of jungle chic. In designing the resort, Autoban worked to preserve the natural flora of the island as much as possible, saving more than 1,000 palm trees in the process. On arrival, guests are wowed by an impressive Manta Ray-shaped welcome jetty complete with undulating Maldivian thatched roof crafted by Istanbul’s Atölye4n, while Tokyo-based Studio Glitt are behind standout Japanese restaurant SAOKE, with its majestic pyramid roof made up of timber blocks like origami, with clean lines and soft lighting reflecting Japanese aesthetics.